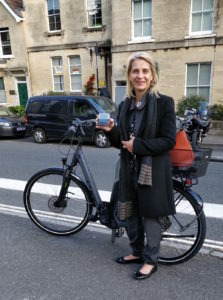 Getting my ebike has transformed the number of journeys I do in Bath by bike. For instance, I had a day when I visited St Gregory’s School, then King Edwards School, finishing up back at Roundhill Primary. Up the hill, down the hill and back up again. Previously, I would probably not have attempted this by bike and would have taken the car instead. So, the ebike has enabled me to take many more journeys by bike, and I would certainly recommend getting one. I convinced my husband to get one, and so now we have got rid of our second car. 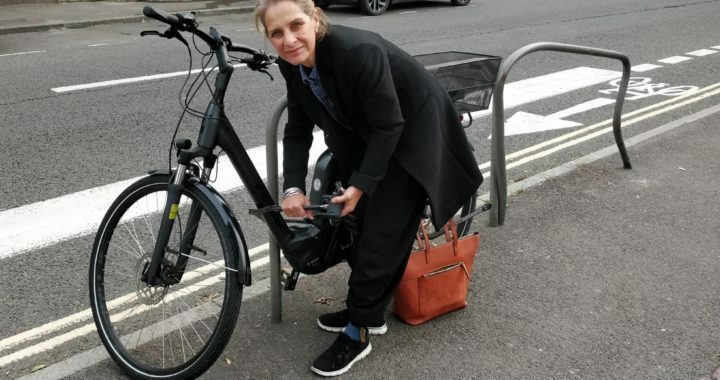 Trying out an ebike is really easy, and a number of the bike stores in Bath will let you have a go. It really helps to get the hang of how the electronic assistance works. Also think about your personal safety equipment; an e-bike is slightly heavier than a normal bike, and you go faster, so I would recommend getting a good helmet and gloves. Obviously, an ebike is a valuable item, so you should also think about some solid locks and safe storage. There is still a big issue around the attitudes of some car drivers to cyclists, and I think it is essential that we offer safe routes for cyclists across our city. This is something I will continue to campaign for.